Part of a two-volume set and now in its third edition, this volume takes a pedagogic approach in providing content for use in core courses. It defines and elaborates on the role of the LNC in a number of arenas and adds new and expanded information covering new technology and new trends in healthcare and the law. It defines the role of the LNC in areas ranging from maintaining records, case management, and research to insurance regulations and forensic investigations. It contains samples of forms used in practice, case studies drawn from real-world examples, chapter summaries that reinforce key concepts, test / review questions at the end of each chapter, an acronym section and a glossary, and references for further study. Senior Editors Ann M. Peterson, EdD, MSN, RN, CS, LNCC, president of Ann M. Peterson & Associates, received a diploma in nursing from Boston City Hospital School of Nursing, a Bachelor of Arts in Psychology, a Master of Science in Nursing, and a Doctorate in Higher Education Administration. Dr. Peterson is an experienced legal nurse consultant working with both defense and plaintiff attorneys on medical malpractice, nursing negligence, personal injury, and criminal cases. She has a background in health care administration and advanced clinical practice, has held an academic appointment as an assistant professor at the graduate level, and has multiple publications to her credit. She is a current member of AALNC and the past president of the Rhode Island chapter of AALNC. She has also served on the Massachusetts Nurses Association (MNA) Congress on Nursing Practice and the Blue Ribbon Commission on Health Policy and Legislation, and is a panel member of the Massachusetts Medical Malpractice Tribunal. Lynda Kopishke, MSN, RN, LNCC received her diploma in Nursing from St. Francis Hospital School of Nursing in Wilmington, Delaware. After many years of successful practice, Ms Kopishke returned to Wilmington University, where she obtained a Bachelor of Science and a Master of Science in Nursing. She became certified as a legal nurse consultant in 2000. She served on the Board of Directors of the American Association of Legal Nurse Consulting at both the local and the national level. 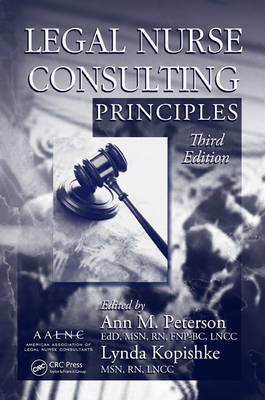 She is past editor of the Journal of Legal Nurse Consulting, a reviewer for the second edition of Principles and Practices, and a published author and national speaker on topics associated with nursing and legal nurse consulting. She operates an independent consulting business, Forensic Matters. Ms Kopishke has been admitted at trial in several states and at the federal level as an expert witness in standards of nursing care as well as in life care planning. She is a nurse educator, researcher, and strong advocate for nursing practice. Associate Editors Teddylen A. Guffey, MHSA, BSN, RN, LNCC, has worked clinically in both nursing and health care administration for 15 years before entering the field of legal nurse consulting. In the years since, Ms Guffey has worked as an independent legal nurse consultant (LNC) and as a professional staff member of the law firm team, assisting in the provision of medical malpractice representation and litigation services. In addition to having her Master's Degree in Health Services Administration, Ms Guffey has authored numerous articles on various topics ranging from health care rationing to the business realities of the LNC's role within the field of Law. She served 5 years on the board of the Phoenix Chapter of the American Association of Legal Nurse Consultants as president, vice president, past president, and program chair and has given numerous presentations locally and nationally concerning risk and medical malpractice management within the health care field. Currently, Ms Guffey is the principal of Guffey & Associates, PC, a law firm specializing in providing business, legal, and risk management services to physicians. She continues to work in the field of legal nurse consulting, risk management, and medical--legal business consulting. Marilyn R. Mason, RN, LNCC has practiced as a legal nurse consultant since 1986. She has worked in both plaintiff and defense litigation, holding positions within law firms as well as practicing in an independent consulting capacity. Her clinical experience includes emergency room, psychiatric, medical--surgical, and administrative nursing. Ms Mason is currently employed at Winer & McKenna, working in the areas of personal injury, medical malpractice, products liability, and employment law. She received her nursing diploma from Barnes Hospital School of Nursing in St. Louis and her bachelor's degree in health administration from St. Mary's College in Moraga, California. She is a registered nurse through the California Board of Registered Nursing. Ms Mason has published in national journals and spoken to and consulted with nurses, paralegals, and attorneys, at both the national and the local levels, on medical issues in litigation. She has been a member of the San Francisco State University Faculty, teaching and advising for the legal nurse consulting certifi cate program. She is a founding member and past president of the American Association of Legal Nurse Consultants (AALNC) and is certified by the AALNC in Legal Nurse Consulting (LNCC). Luanne Trahant, MSN, RN, LNCC has been a legal nurse consultant for over 9 years and is the co-owner of Consulting Concepts of Louisiana, Inc. She has been a practicing registered nurse for over 17 years in multiple nursing and administration settings, including medical surgical nursing, orthopedics, rehabilitation, long-term care, home health, hospice, pediatrics, intensive care, cardiology,and psychiatric care. Mrs. Trahant has served her profession as a staff nurse, charge nurse, director of nursing, and administrator in long-term care settings. She received her Bachelor of Science in Nursing from Northwestern State University in 1992, a Master of Science in Nursing from the University of Phoenix in 2005, and is currently completing a postgraduate certificate as a Family Nurse Practitioner. Mrs .Trahant plans to serve the elderly population as an FNP. She is an active member in national, state, and local nursing associations and forums to help advance the nursing profession. Additionally, she is an avid supporter and advocate for the advancement of nursing in long-term care and the elderly population. For the last 9 years, she has provided independent consulting and expert witness services to plaintiff and defense attorneys nationwide in the areas of long-term care, rehabilitation, orthopedics, administration, and general nursing standards. Margaret S. Wacker, RN, PhD is the Director of Nursing at Lake-Sumter Community College, and the President of Wacker and Associates. She is a nationally recognized speaker, writer, and expert witness in pain management. She is an experienced legal nurse consultant working for defense and plaintiff attorneys on issues of nursing negligence and pain management. She is active in professional organizations, received the Florida Nurses Association District 14 Nurse of the Year award in 2006, and has served on the Rhode Island Attorney General's Task Force for End of Life Care since 2001. She has held academic appointments at the University of Rhode Island and Yale University. She was a graduate of Saint Catherine's School of Nursing, received her Bachelor of Nursing at New York University, a Master of Science degree from Adelphi University, a Master of Arts degree in Anthropology from the State University of New York at Stony Brook, and a PhD in Nursing from New York University. Tracy Patrick-Panchelli, BSN, RN-BC, CPN has been an AALNC member since 1999 and has had an independent legal nurse consulting practice, focusing on medical malpractice plaintiff and defense work, since 2001. In 2009, she was elected President of the Philadelphia Chapter of AALNC and also became a member of the planning committee for the AALNC National Educational Conference. Tracy earned her Bachelor of Science degree in Nursing from the University of Pennsylvania in 1993 and matriculated in the Master of Science in Nursing--Health Care Administration program at Villanova University in 2009. She is a certified pediatric nurse and is also board certified in nursing professional development. She is employed by Nemours/Alfred I. DuPont Hospital for Children in Wilmington, Delaware, as Coordinator of Nursing Continuing Education and as a staff nurse on the Critical Care Transport Team. Claire A. Hoffman, MS, RNC, CDDN, CLNC is the president of Hoff man Associates, a health care and medical legal consulting firm, which focuses on all aspects of geriatric care, developmental disabilities, regulatory compliance, and standards of care. She has been in legal nurse consulting for 23 years and has been retained as an expert for both plaintiff and defense law firms throughout the country to conduct record reviews, determine case merit, and consult with attorneys in preparation for depositions/trials, and as an expert witness. Ms Hoffman has been recognized by the US Congress and professional associations for her advocacy for individuals with developmental disabilities. Cheryl E. White, RN, BS, MSHL, LNCC, LHRM, MSCC, DFSHRMPS has almost 25 years of extensive legal nursing experience. She has an MS in Health Care Law, a BS in Health Care Administration, and over 30 years experience as a registered nurse. Cheryl has been a risk manager for three large health care organizations, works for the Florida Board of Medicine as an inspector of physician offices seeking licensure in levels II and III office surgery, and has worked the last eight years as an in-house legal nurse consultant to a defense firm. Cheryl is also a certified Medicare Set-Aside Consultant.